I had fun once…dint like it! I can't stop laughing!! I'm such a bad person.. ah ah ah ah ah !!! Looks like a young Luke Skywalker....then he went to the dark side! Kevin hart laughing in the back. 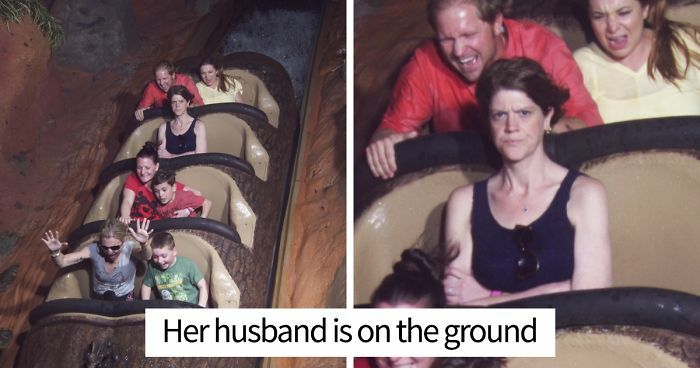 The guy next to him who regrets getting on the ride. The guy next to the armless guy, who either is his friend and staged the photo, either is gonna need therapy for the next of his life. The guy in the first row, who is chill af. the girl next to him, who looks like she met her bff at the mall. This photo is wild. That moment when you realise the survival of your family rests solely upon you. I'm telling you we Asians are hard to impress. Thats the best one so far! #30 This Roller Coaster Takes You Stright To The Audition Of "How The Grinch Stole Christmas"
They look like the troll dolls I had when I was a kid! Phew. That was a close shave. Looks like the person behind her has an arm for a leg. Aww poor kid. This is look of pure horror. I feel so bad for laughing. That's my face for everyday life. Alright, Calm down Vince Vaughn! Kids: NO GOSH PLEASE NO, NO NO NOOOOOOOOOO!!!!!!!!!!!!! Major bonus for the "boxing" theme on the "Raging Bull" Coaster.... That's good theming! Now THAT''S how ya do it--Go pro or go home! #56 I Proposed To My Girlfriend On A Roller Coaster. She Said Yes! Your beard is a great success. There's a sale at Macy's! The goose was hit and then killed by the front of the coaster and then flipped up into Fabio's face. The blood is his as he had a cut. This happened at the official opening, with media all present - what are the chances? And in future years, he can always say truthfully: "Honey, you look as beautiful as on our honeymoon."